Retired American woman from the Pacific Northwest living between Seattle and Brazil: Traveling the world and learning how to live and age gracefully...share my thoughts and stories from a lifetime of exercising and preparing fresh food while I become a full time writer and fluent in Portuguese. Plus together we can experience the incredible culture and landscape, the rivers and beaches in beautiful Brazil, Puget Sound and wherever else I go. Our delightful tour guide Karim had an ambitious agenda laid out for getting to know the region and the Amazon rainforest. We left our hotel a little after 8 am and drove to the Zero Impact Brazil (ZIB) sawmill on the outskirts of Santarém. There we met Rick, the owner of ZIB, BigTreeAdventures, the mill and the forest we would visit. Rick is the diametric opposite of an exploiter. He is well into middle age and has the strong body of someone who has benefited from a lifetime of physical fitness. He is an avid kite surfer, hiker, skater and a very skilled lumberman. He moved to Brazil from Michigan to develop a sustainable hardwoods company. His interest in Brazilian hardwoods came from running a lumber mill and forest products business in Michigan. Now he owns a large tract of undisturbed rainforest about 70 kilometers south of Santarém and manages it by taking only those trees that are dead, dying or down. Rick explained the philosophy behind his lumber business, Zero Impact Brazil. In the rain forest, he told us, trees are continuously recycling. If your goal is sustainability, Rick said there are a lot of trees, often very large trees, that fall over in wind storms, or become diseased and then fall, or are choked by vines and eventually die. It is these dead, dying and down trees that Rick harvests and mills in his lumber mill. He showed us samples of the more than twenty hardwoods he sells. The samples ranged from black to purple to red to gold to multi-hued stripes and every shade of brown found in nature. Most of his product is raw wood that he ships to the United States. He also manufactures custom-made furniture out of the beautiful woods. Rick tries to grow or raise most of the food he and his employees eat – at the lumber mill we saw raised vegetable beds and many types of fruit trees. He lamented his lack of success with tomatoes which he explained simply get too much sun on the equator to grow successfully. He is still trying and had some of his raised beds covered in shade cloths. At the sawmill chickens run around everywhere and multiple roosters compete for the best crowing. We ate the hens’ eggs for breakfast and they are delicious. Rick told us that he was going to have to cull the rooster population. It turns out they compete for the prettiest hens also. After touring the sawmill we piled into cars and drove to an old American town. That’s right. There are two old American towns near Santarém – one, Fordlandia, is pretty much abandoned, but the other, Belterra, is still a working town – although it has never had the economic success from rubber production that its founder Henry Ford imagined. Ford started the towns in 1928 and 1934 respectively, hoping to grow rubber trees in large plantations and harvest enough rubber to meet the growing demand of his automobiles. He arranged to have everything necessary to support a comprehensive town shipped from Michigan. But unfortunately he did not consult any botanists – only engineers. His first attempt, Fordlandia was a complete failure. The town was too far away for any kind of reasonable access; the fields were challenged by flooding and soil loss; the trees were plagued with a deadly leaf fungus and destructive insects; and the Brazilian workers protested the enforced mid-western life style. Ford’s second attempt in Belterra fared better but never produced at the level Ford expected. After the end of the Second World War, Ford sold his rubber interests to the Brazilian government and wrote off millions of dollars of loss. The few remaining trees do not produce at commercially viable levels but, with the exception of the hospital that burned to the ground a few years ago, the mid-western buildings, homes, schools, churches and community center are all still in use today. The town, complete with American-style fire hydrants, looks as if it should be located in the upper Michigan peninsula – not in the middle of the Amazon. After touring Belterra and enjoying its small museum, we drove out to Rick’s forest. We parked at his next-door neighbor’s farm and met the family. The farmer is a charming, small-scale manioc producer who, unlike many of his neighbors, did not sell his land to the big soy producers. Like Rick and Karim, he respects and protects the forest. One of his sons works at Zero Impact Brazil and another son was our guide in the forest. He seemed to know everything there is to know about the properties of the various plants that grow there. We hiked from the small farm down a well-built trail to a groundwater fed stream – a black water igarapé that rises on Rick’s land. Rick has built a series of platforms and walkways over the stream to create a swimming hole – perfect for a refreshing swim. It was an amazing experience to jump in water in the middle of the jungle and find that the water is cool and free of insects. The water’s natural acidity keeps it free of many undesirable insects while its groundwater origin keeps it cool. After a good swim, and a quick look at the nearby cabin and bathroom Rick built for overnight guests, we explored the forest in earnest. It was beautiful – more open than I expected and full of light that filtered down from the sky. We saw an infinite variety of trees and understory plants in every shade of green imaginable. As we went along, our local guide cut back branches and vines so that the trail was easily accessible. Karim had promised us big trees and big trees we got! Virtually all the trees in the forest are so tall we couldn’t see their tops but some are so big we couldn’t even see around them. 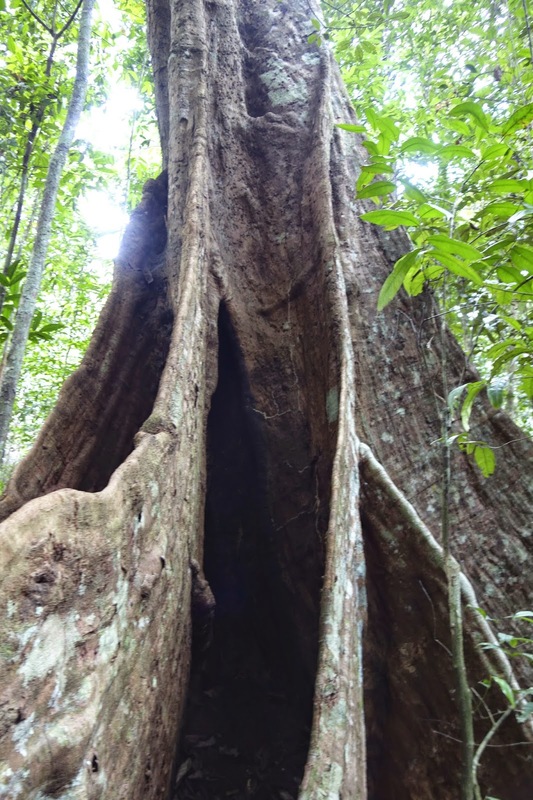 The tall root structures of a Kapok tree we saw were perhaps the most impressive – the tops of the smooth wooden buttresses growing outward from the giant main trunk were high above my head. Here and there along the trail, Rick showed us examples of weaker trees that he might harvest in the future. Sometimes the weakness was the result of invasive vines he explained and sometimes it was due to a lightning strike or a very strong wind. We saw a huge tree that had fallen over in a recent storm. Zero Impact Brazil is in the midst of harvesting this tree. Its sheer biomass was mind-boggling. Our guide showed us large seedpods that he and his family use to attract wild animals. Part of their livelihood comes from hunting. As the afternoon wore on, we realized we were more than ready for lunch. We returned to our starting point to find a delicious lunch ready and waiting – prepared in the outdoor kitchen that belongs to Rick’s neighbors. We tucked in and sat together at a wooden picnic table, relaxed and happy and certainly more knowledgeable about the rainforest. When it was time to leave, we bade our new friends goodbye. As we drove back to Santarém, we looked at the cleared land along the highway, land that was waiting to be planted with soybeans, with a great deal of sadness. I can't help but think of The Great Kapok Tree book we used to read. I wish more people could experience the Amazon as you guys have to understand its role in the region and the world.